The global off-road vehicle market, a dynamic vertical of the automotive space, had been valued at an appreciable $19.5 billion in 2017. One of the pivotal factors responsible for the growth of this industry is the rising disposable income and the resulting improvements in the standards of living that have fueled the growth of recreational activities. Indeed, recreational activities are estimated to hold approximately 25% of the overall off-road vehicle market share by 2024, primarily owing to an increasing number of off-road vehicle being incorporated in touring, leisure and a plethora of other recreational off-road activities. The market for off-road motorcycles like adventure and dirt bikes was previously well defined with dirt-bikes governing the off-road territory and street bikes handling the tamer terrain. However, with the introduction of dual-sports motorcycles, tackling two different terrains with the same bike has become possible. According to a report by Web Bike World, though the U.S. motorbike market witnessed incredible growth from the late 1990’s to the late 2000’s with a record 1 million motorbikes sold in 2005, the market hit a major slump in 2009 and 2010 due to the economic crisis. However, with recovering economy, introduction of newer models with better capabilities and the growing trend of bike touring and off-roading as a recreational activity, the off-road vehicle market from off-road motorcycles market has steadily started to recover and has been depicting commendable growth. As per estimates, around over 500,000 motorbikes were sold in the U.S. itself in 2015. One of the companies that has made it presence felt in this sector is BMW USA that has fared substantially well in this recovering market and has managed to exhibit a double-digit growth rate in its November – December 2017 sales when compared to the sales in 2016 for the same period. Also known as a quad, quad bike or a quadricycle, the ATV is a much-preferred off-roading vehicle than the off-road motorcycles. Though not as nimble and versatile as motorcycles the ATV provides a much more stable ride experience and offers more safety than a common dirt bike, which is why the vehicle is much more popular and synonymous with off-roading, especially across the developed economies. As per estimates, North America alone accounted for 50% of the global ATV market in 2017. This meteoric rise of ATV sales in North America can mainly attributed to increasing recreational activities and a growing trend of employing ATVs for other non-recreational activities like patrolling national forest, mountain trails, surveying agricultural lands, under-development residential lots and traversing tricky terrain during hunting activities. Powered by the ATV’s exceptional performance ability to travel in rough terrains, off-road vehicle market share from ATVs is anticipated to register a CAGR of 3.5% over 2018-2024. According to a 2017 report by the Specialty Equipment Market Association (SEMA), the mainstream use of UTVs has predominantly been in commercial activities. In today’s scenario, UTVs designed for commercial activities are far outselling the ones designed for purely recreational activities, as a result, the UTV segment held over 45% of the revenue shares of the off-road vehicle market in 2017. These sales numbers could also be attributed to the advantages offered by added features like roll-cages, seatbelts, storage facilities and the ability to seat multiple passengers. Previously, UTVs had well defined roles – vehicles like the Beach Buggies were designed to handle flat, sandy surfaces like beaches and flat deserts, while the more powerful Dune Buggies were designed to handle large desert sand dunes. However, due to rising applications in commercial activities, UTV manufacturers are producing vehicles that could be used to accomplish several different tasks without any mechanical modifications. Moreover, with the recent rise of off-road recreational activities as a national pastime, the generic breed of UTVs used for commercial activities are easily adjusting to this new role, catapulting the growth of the off-road vehicle market further. 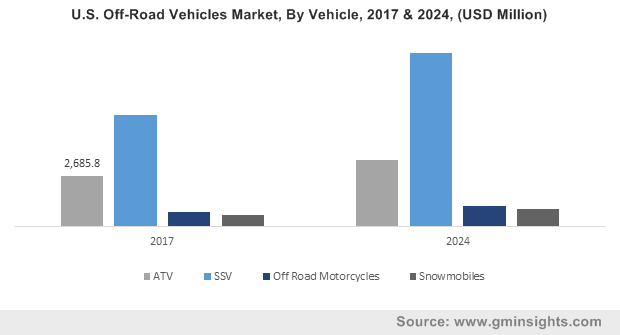 The accelerated rise of recreational activities and the growing versatility of off-road vehicle is certain to impel the large-scale commercialization of the global off-road vehicle market. While North America continues to be a prominent regional ground, the APAC region is also exhibiting growth and is projected to account for 10% of the global off-road vehicle market by 2024. In due course, untapped regions are also expected to hold substantial promise for the growth of this vertical. As per Global Market Insights, Inc., the overall off-road vehicle market size is slated to cross a dynamic $28 billion by 2024.